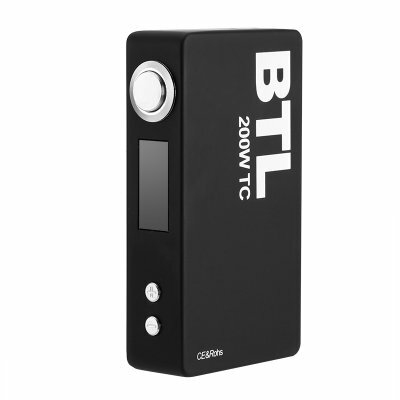 Successfully Added BTL 200W Box MOD - VW/TC, 5 To 200W, 1.5 To 8.5V, 200 To 600 Fahrenheit, 0.1 To 1.0 Ohm, OLED Display to your Shopping Cart. The impressive BTL 200W MOD from BetterLife brings some cool features that will blow your mind but not your wallet. This BLT 200W box mod has a nice compact design and measuring just 100mm top to bottom 56mm across and 24 mm in depth it fits comfortably in the hand. This VW/TC MOD box has an atomizer resistance range from 0.1 to 1.0 ohm and the 510 threading connection makes it compatible with most tanks. The variable output wattage starts from just 5 Watt and can be cranked up to 200 Watts maximum output, which is a perfect range for sub ohm vaping. The BetterLife 200 Watt box MOD runs of two 18650 batteries (not included) and has a sweet OLED screen to keep you appraised of how much power is left as well as all the other settings. Swapping the batteries couldn't be easier as you just lift the back panel which is securely held in place by strong magnets. A large fire button has smooth action and is located where it is comfy to use while the OLED display and settings buttons are all laid out well. A temperature control mode lets you select between Nickel (Ni), Titanium (Ti), Stainless Steel (SS) or custom options while the power mode gives you direct control on the wattage. With power protection modes and an easy menu system, this is an excellent little mod that does everything you could want. With its high end feel and nice finish this premium box MOD has a surprisingly cheap price tag. The BetterLife BTL 200W MOD Box comes with 12 months warranty, brought to you by the leader in electronic devices as well as wholesale vape kits and box MODs..
Arabic: - وزارة الدفاع في مربع المبخر - Chinese Simplified: - 汽化器框 Mod - Czech: - Zvlhčovač vzduchu Box Mod - Dutch: - Vaporizer vak Mod - French: - Vaporisateur Case Mod - German: - Vaporizer Box Mod - Hebrew: - מכשיר אידוי תיבת Mod - Hindi: - Vaporizer बॉक्स मॉड - Hungarian: - Párologtató doboz Mod - Italian: - Vaporizzatore casella Mod - Japanese: - 気化器ボックス Mod - Korean: - 기화 기 상자 Mod - Malay: - Mod Peti vaporizer - Norwegian Bokmål: - Fordamper for Mod - Romanian: - Vaporizator Box Mod - Russian: - Испарителем Box мод - Spanish: - Vaporizador caja Mod - Thai: - Mod กล่อง vaporizer - Turkish: - Buharlaştırıcı kutusu Mod - Vietnamese: - Vaporizer Box Mod.